Corn in the front yard was not the norm on homesteads, but the sod house was always intended to be a temporary dwelling anyway, just until money could be raised for the lumber to build a proper wood frame home. The symmetry, in age and placement, of the two trees makes it likely that they were intentionally planted. 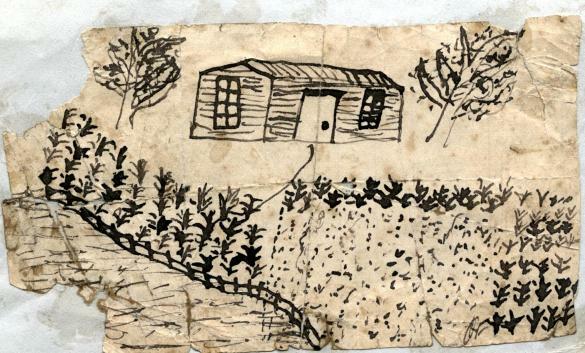 My own great-great grandmother lived in a sod house on the plains of Colorado. Touching, in an odd way. Charming picture. I wonder what else is planted in the garden? Having visited the plains of Colorado two summers ago, I can appreciate what kind of resolve and constitution it took to make that place your home, like Kansas-lite. Don't laugh, Arcady, I'm just about to get a degree in landscape design from Versailles Ecole du Paysage... So guess what? I cannot take you more seriously than what you say in your profile! Very happy to be connected to your blog from now on. Such a great news. Thanks!